The month of May brings us closer to the end of the school year– and closer to final exams. 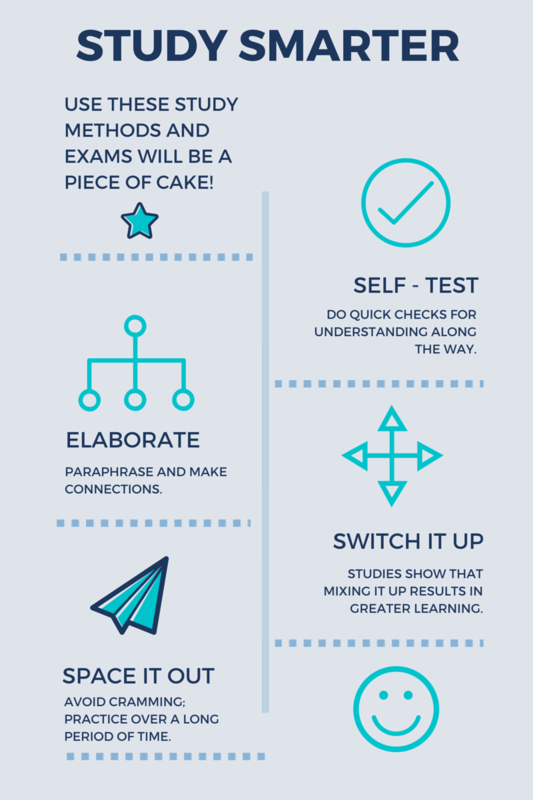 Whether students are studying for their very first middle school finals or seasoned seniors are gearing up for dual-enrollment and AP exams, the following study tips, discussed by Personalized Learning Coordinator Susan Rose, can be extremely helpful in feeling and being prepared. “Study for your test.”, “Did you study?”, “I need to study.”, “You didn’t study hard enough!” How often do we toss these phrases around as parents, as teachers and as students? ‘Study’ is an extremely vague word and means different things to different people. When we tell our students to go home and study, they often have no idea about how to effectively go about this. Does it mean reading the chapter again and again until you know it? Does it mean making flash cards and drilling with them? Does it mean re-reading your notes 20 times or memorizing a list of definitions? While all of these are widely accepted, traditional “study” methods, they can also be a huge waste of time if true learning and retention are our optimal goals. These tried and not-so-true strategies fail to take into account the past 20 years of illuminating research that has occurred in the fields of education, neuroscience and psychology concerning what really helps us learn and remember information. A student’s defaut study method is often to read over a chapter or look over notes. This is still the number one study strategy in colleges, yet as pointed out by Brown, Roediger and McDaniel (2014), this method is faulty for at least three reasons. First, it leads to “illusions of knowing” or “Illusions of competence” as phrased by Dr. Barbara Oakley in her Coursera Course, Learning How to Learn. Students who have the book or notes open continuously during the study process tend to perceive that they know more than they do. Second, learning this way doesn’t stick around. And finally, rereading takes a lot of time. So, what is a student to do? One of the most powerful learning methods involves reading and then shutting the book and retrieving what you can remember. This active ‘retrieving’ of information is difficult for the brain, and this very difficulty is what leads to long term retention. One study showed that this process of retrieving information from working memory enabled students to remember significantly more information long term than did repeated studying, rereading or even concept mapping. This retrieval method of study is a form of self-testing, which is also one of the most potent learning tools students can use. Self-testing can take many forms, from simply closing the book and writing down everything you can remember, to making up tests, flashcards or matching games and working with them until you are competent with the information. Students often enjoy using computer programs such as Quizlet for generating self-tests. How ever they do it, self-testing is an effective use of time. Elaboration when reading or studying notes has also proven to be an extremely helpful learning technique. Elaboration in this context refers to paraphrasing the information into your own words, as you make sense of it, and also talking (or thinking) about how this connects to what you already know. Making these kinds of connections helps learners remember– and understand– long term. Highlighting as you read is another traditional and popular learning tool. Highlighting, however, is only found to be effective if the student reads with extreme focus and highlights sparingly, noting only key information. If this focus is lacking, it becomes a mindless task. Noting key words or phrases in the margin has been found to be a much more effective method than highlighting because it turns requires actively processing the information being read. Current research has also dispelled another common practice; studying one thing continuously until you think you have it. Studies have shown that a method called interleaved practice results in greater learning, especially when long term retention is the goal. Interleaved practice is, in short, mixing it up. Interleaving involves alternating what you are studying. This can include mixing in different kinds of math problems instead of practicing one type until you get it, or even mixing up your subjects during study sessions. This kind of learning may seem slower than desirable to both the student and the teacher, but the very nature of what is happening in the brain that makes this process seem a bit more laborious is what makes the learning superior and last longer. A final educational technique that works is not new at all; in fact, it has been researched for over a century. This strategy is known as spaced practice. This involves spacing out practice and learning over a longer period of time rather than continuously studying a subject (i.e. mass or concentrated practice or “cramming”). When learning is spaced out at intervals, long term retrieval and comprehension are far superior. Students have been found to learn twice the amount of information by spacing their studying over time, according to Benedict Carey in How we Learn (2014). Yet, students continue to cram for tests and then have to start all over again when the time for final exams roll around. Carey points out that students should let time pass between self-testing and study sessions. The amount of time should vary according to what they are studying. If you are learning a list or unfamiliar terms, at first you may need to study again within a few minutes. Other new subject matter may be reviewed within only a day or two, and then, spaced out to once a week. Some teachers at Grandview have taken this research into account in their classrooms. Two instructors have begun cashing in on the knowledge that students retain more information when they are tested on small chunks, and more frequently. They have begun giving weekly, lower stakes assessments in their classes to ensure that students are able to make and understand connections between engaging classroom learning experiences and information in their textbooks and notes. Not only does this method help students comprehend and retain more information over time, it encourages them to keep up and naturally space their practice. These methods apply to all learners, even to those who have retrieval difficulties. These ways of learning may not be “easier” in the strictest sense of the word, and that is a very good thing. The very difficulty in a task like retrieving what you have just read or heard, or the thinking involved in self-testing, is what makes learning stick around. And after all, what does an A mean if we don’t truly learn and retain new knowledge? So, go study! Brown, Peter C., Roediger, Henry L., & McDaniel, Mark A., (2014). Make it Stick. Belknap Press, Cambridge, MA. Carey, B. (2014). How We Learn; The surprising truth about when, where, and why it happens. Random House, New York, NY. Karpicke, J. D., & Blunt, J. R. (2011). Retrieval practice produces more learning than elaborative studying with concept mapping. Science, 331, 772–775. Tags: 21st Century Learners, Academics, exams, Learning, study. Bookmark the permalink. Great article by Susan Rose!